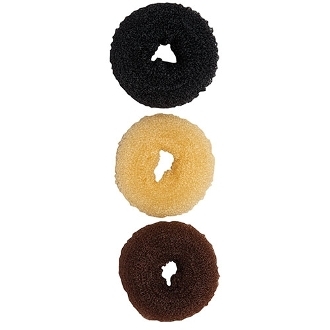 The Bunheads Bun Builder is a one size fits all polyester donut used to create perfectly neat buns. Simply pull your ponytail through the center of the builder, slide it to the base of your pony, arrange your hair around the builder, secure with hair pins and voila: the perfect bun! Completely reusable, hand wash the builder with mild detergent and let air dry. One builder per package. Choose from Adult or Jr.